There are a few factors to consider before formulating cold process soap recipes. From the Common Soapmaking Oils post to the Back to Basics Series, we’ve got plenty of resources to help you get started. You can never go wrong with a 34/33/33 ratio. That’s 34% olive oil, 33% coconut oil, and 33% palm oil. They’re commonly used because they complement each other well. Palm oil acts as a secondary lathering agent and hardens the soap, coconut oil is cleansing and produces big bubbles, and olive oil is moisturizing and gives bars a silky feeling. If you don’t want to use palm oil, learn more about alternatives here. Another standard recipe is the 30/30/30/10. 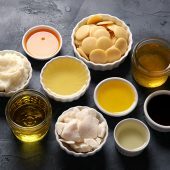 That’s 30% olive oil, 30% coconut oil, 30% palm oil, and 10% of something special – rice bran oil, sweet almond oil, shea butter, or mango butter are all good options. 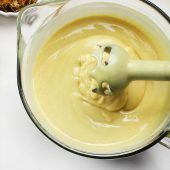 The additional oils and butters each add a unique feeling to the recipe. 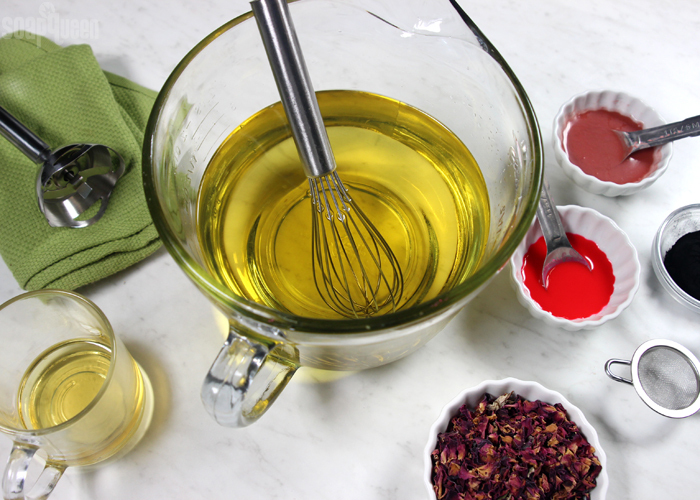 To create your own recipe, start by choosing your base oils. You can use each one around 20-30%. For the remaining portion, consider what you’d like the bar to feel like. Do you want it to be super moisturizing, have a nice thick lather, or to be hard and long lasting? Then, check out Common Soapmaking Oils. It lists the properties and usage rates of the oils so you can choose the right one for your recipe. There are a few general rules that make formulating recipes easier. Oils that are liquid at room temperature tend to trace more slowly. A high percentage in your recipe is great for intricate designs. The soap will take longer to harden in the mold and it will feel softer than a recipe with a high percentage of hard oils. Hard oils – the ones that are solid at room temperature – trace more quickly. 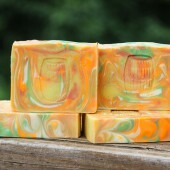 The soap will unmold faster and the bars will feel firmer than a recipe with a lot of liquid oil. Any soap can be made with just one oil, but the only ones we recommend using up to 100% are olive oil or coconut oil. The others can feel too sticky, too hard, etc. Learn more in the Single Oil Cold Process Soap Lather Tests. Most recipes are a combination of hard and soft oils. 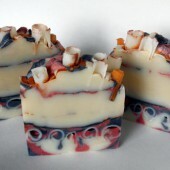 If you want to create hard bars without palm oil, check out Palm Oil Alternatives in Cold Process Soap. You can substitute oils in your cold process recipe. 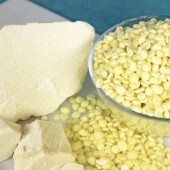 For instance, canola or rice bran can be used in place of olive oil. Learn more in the Substituting Oils post. While we do our best to formulate a recipe so we can predict exactly how it will behave, there are an unlimited number of variables that can lead to unexpected results. The best way to find out what works for you is to experiment. Start with these rules and then adjust based on your personal preferences. Here are a few tried-and-true recipes we love. They’re superfatted at 5%. This one is simple and reliable, so it’s great for beginners. The castor oil gives it a luscious lather. 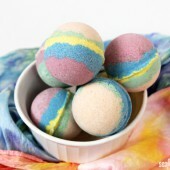 The recipe is similar to our Lots of Lather Quick Mix. Coconut Oil 10.9 oz. 10.4 oz 20.9 oz. 17.4 oz. Palm Oil 10.9 oz. 10.4 oz. 20.9 oz. 17.4 oz. Olive Oil 10.9 oz. 10.4 oz. 20.9 oz. 17.4 oz. Castor Oil 1.4 oz. 1.3 oz. 2.6 oz. 2.2 oz. Lye 4.9 oz. 4.7 oz. 9.4 oz. 7.8 oz. Liquid 11.3 oz. 10.8 oz. 21.6 oz. 18 oz. 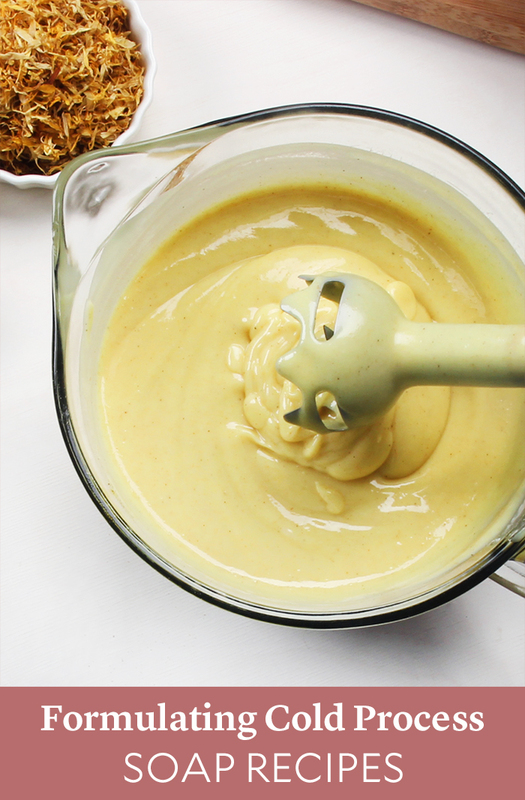 This is a fairly standard recipe with a few moisturizing extras like sweet almond oil and mango butter. Shea butter in place of mango feels lovely as well. Coconut Oil 8.5 oz. 8.2 oz. 16.3 oz. 13.6 oz. Palm Oil 8.5 oz. 8.2 oz. 16.3 oz. 13.6 oz. 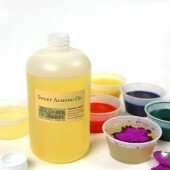 Sweet Almond Oil 5.1 oz. 4.9 oz. 9.8 oz. 8.2 oz. Mango Butter 1.7 oz. 1.6 oz. 3.3 oz. 2.7 oz. Lye 4.8 oz. 4.6 oz. 9.2 oz. 7.7 oz. This is a wonderfully slow-moving recipe that’s great for intricate designs. Coconut Oil 5.1 oz. 4.9 oz. 9.9 oz. 8.2 oz. Canola Oil 10.3 oz. 9.9 oz. 19.7 oz. 16.4 oz. Rice Bran Oil 8.6 oz. 8.2 oz. 16.4 oz. 13.7 oz. 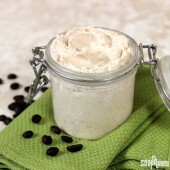 Shea Butter 5.1 oz. 4.9 oz. 9.9 oz. 8.2 oz. 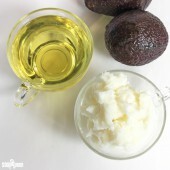 Avocado Oil 3.4 oz. 3.3 oz. 6.6 oz. 5.5 oz. Chia Seed Oil 1.7 oz. 1.7 oz. 3.3 oz. 2.7 oz. Lye 4.5 oz. 4.4 oz. 8.7 oz. 7.3 oz. This option is great for more than just swirls – you can use it for other intricate designs like layers and embeds. It’s similar to the Swirl Quick Mix. Coconut Oil 6.8 oz. 6.5 oz. 13.1 oz. 10.9 oz. Palm Oil 10.2 oz. 9.8 oz. 19.7 oz. 16.4 oz. Canola Oil 6.8 oz. 6.5 oz. 13.1 oz. 10.9 oz. Hazelnut Oil 2 oz. 2 oz. 3.9 oz. 3.3 oz. Rice Bran Oil 3.4 oz. 3.3 oz. 6.6 oz. 5.5 oz. Sunflower Oil 3.4 oz. 3.3 oz. 6.6 oz. 5.5 oz. Lye 4.7 oz. 4.5 oz. 9 oz. 7.5 oz. This post was updated in November 2018. The fragrance amount depends on the total amount of product you are making and it is considered an additive so you would not reduce anything further from the recipe. As for the liquid, we do typically use water but you can use milk, tea, beer or wine as well. I have been trying some swirls, but they end up looking kind of blah! Any advice?? Thank you. 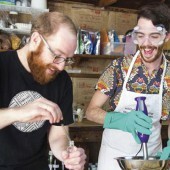 Ps my husband thinks it’s weird that I watch videos of people making soap all the time, now! You’ll also want to make sure the mica you’re using works well in cold process soap. While many perform great some can morph colors in CP or disappear. I would add in the Castor Oil at 5% or less of the recipe. That would help add a creamy lather. You can reduce one of the liquid oils for that amount. You would then want to run the recipe with the new oil amounts through the Lye Calculator to make sure the lye / water amounts don’t change too much. Hi, I tried making cp soap with your 50 oz old faithful recipe. But when I poured lye to oil and blended on spurt, solid-like thing accummulated on the blade. When I mixed the batter with spatula, small white specks appeared. They didn’t disappear despite mixing manually or with blender. They were hard when pinched, but I was able to shatter it if I pressed hard. I haven’t added essential oil or colorants to it. Just the oil and lye water. The mixed water and lye was not as yellow as I saw on your video. Mine was paler, almost going to white. Would you advise me? Thank you in advance! It sounds like you might have seen some ricing happen which normally happens because of the fragrance. Find more information on ricing here. Thank you for replying! I have already read the attached link. But the white specks appear before I added in any fragrance. Is it still stearic acid? If the white specks happened before you added your fragrance it sounds like you did get Palm Stearic spots. When your recipe starts to cool dow your oils/butters, especially Palm Oil, can form those specks. I thought I had commented before but it seems that it didn’t work…strange. Anyway, I have made cold process soap a few times before and want to get back into it. Would this create a bar as described? Do you have any advice for me on my recipe, or does it look alright? Of course, I’d have to experiment a bit, but I just want to know if I’m on the right track. Love the website, as always. It’s full of such great resources. Thank you very much, I appreciate your time. Hi! Thanks so much for these helpful resources. I’m currently preparing to make my first batch of CP soap and had a couple questions about formulating the recipe. If I’m planning to add a couple ounces of essential oil and colorant that’s mixed with something like almond oil, how should I account for that when calculating the recipe? If I’m using a 50 oz mold, should I formulate a recipe that’s less than 50 oz in anticipation of the extra few ounces from the colorant, almond oil, and EO? Or should I calculate the base recipe for 50 oz and then add the additives on top of that, if being a few ounces over is okay? Essential and Fragrance Oils are considered additives. They would be added in at trace and would not affect your Lye or Water amounts in the recipe. 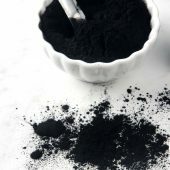 We also normally don’t adjust our recipes for amount of oil used to prepare colorants since it is such a small amount it will just count as a little extra superfat. If you are concerned you can take that amount of oil out of one of your Liquid Oils in the recipe if they match. A few ounces over should be just fine though. Amazing issues here. I’m very satisfied to look your article. contact you. Will you kindly drop me a mail? How do you know how long to leave a batch in the mold before cutting? The first one was coconut, olive, and castor, and was still a slight bit soft when I cut it about 48 hours after pouring. The second was coconut, olive, castor, shea, kokum, and sweet almond, and shattered when I went to cut it about 48 hours after cutting. Since I’m new to soap making, I didn’t do any water discount, but did superfat by 5%. It depends on the specific recipe as well as the mold you’re using. 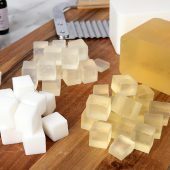 If the soap is made with softer oils it will take longer to fully harden and be able to cut, harder recipes will take a shorter amount of time. Soap made in silicone molds also normally take longer to harden. I normally check the soap after 24-48 hours to gauge how it’s hardening. After unmolding the soap and cutting if I see drag marks I will also give the soap another 24 hours before trying again. 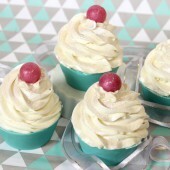 May I use a 100% coconut oil recipe (with superfat) and use it for piping cupcake soaps ? It’d be to hard to pipe? Every time I use olive oil in my soap I have bad results with dos. I have tried many different labels but it feels like gambling. I don’t feel safe to use it anymore I never can predict the outcome and I havent found a reliable brand. Or can I use another oil instead of olive oil ? You can make 100% Coconut Oil soap if you use a higher superfat, normally about 20%. If you don’t want to use Olive Oil, Rice Bran Oil also makes a good substitute for it. I love your site. I’ve been making cold-process soap for a few years and have started playing with my own recipes. My question is about acceleration. I have modified a basic recipe that worked well for me. I have been using olive oil infused with various botanicals in my basic recipe. 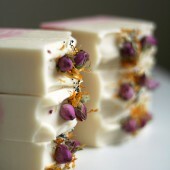 , I use rose petals, calendula, lavender, and rosemary to infuse the oil before I use it in my soap. 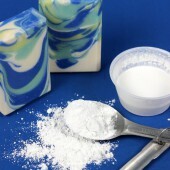 I also add titanium dioxide to make the soap lighter in color. The trouble I have is that the soap gets so thick so quickly that it is nearly impossible to get into the molds without air pockets, even if I tap the molds. I have been careful about temperatures when I mix the oils and lye. Am I right in suspecting the infused oil is causing acceleration? I think you’re right and it is the infused oils causing acceleration, especially the floral infusions. 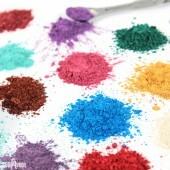 Depending on the amount of Titanium Dioxide you’re using that could also be partially causing the thickening in trace. Hi, I’m a newbie or should say wanna be…. 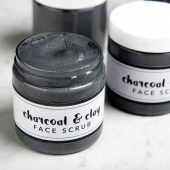 I would like to add charcoal and clay to my recipe, but can’t find out how much I can or should add per pound of soap? Hi Robin, typical usage rates for those additives is one teaspoon per pound of soap base. Hi, I am developing a recipe and wanted to get your thoughts. I am trying to make one that is good for dry skin, so I reduced the typical amount of coconut oil. What do you think about this recipe? Should I make any changes? Thanks!! We haven’t tried a recipe quite like that before but it looks good. It should definitely be nice and moisturizing with the higher superfat amount and creamy goats milk. If you find you want the soap harder you can also try adding in Sodium Lactate at 1 tsp per pound of oils in your recipe to the cooled lye water. Hello, Do you have a cold process soap recipe using olive oil, coconut oil, lard, canola oil, almond oil, and castor oil? Thank you so much and have a great day. We do not have a recipe quite like that. 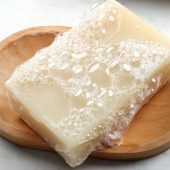 If you’re wanting a recipe with lard you may like our Lard & Loofah Cold Process Soap, it has a pretty similar combination of oils. 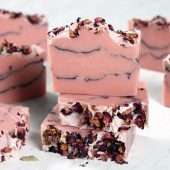 Hi, I am completely new to soap making, that new I haven’t even made any yet – just researching 😀. I would like to make soap that would be safe to use on myself but could also be used on my dogs. What would be the safest oils to use when formulating a recipe? I believe dogs ph level is different to a humans. Also, could essential oils be used too? We have not made a soap recipe specifically for dogs before. I have hard you would normally want to use a much higher superfat in dog soap recipes. Dogs do have a skin pH different from humans though so you probably wouldn’t want to use the same soap. Thanks for your reply. Would the high superfat be to increase the amount of oils left or to change ph levels and what level would you recommend? I’m not 100% sure since we haven’t tested the recipe ourselves or made a dog soap recipe. That was a recommendation by a customer to make cold process soap more suitable for dogs so you are more than welcome to try it out if you’d like. Where there is only coconut oil, palm oil and Palm kernel oil available. Will it give good result and what percentage recommend do you recomend? You can try using just those oils but the soap may be a little more harsh and brittle. A higher superfat, like 20% will help. We use Vitamin E as an additive all the time so I don’t think it should make much of a difference, but it doesn’t saponify so it won’t turn into soap. I would check on the amount included in the Sweet Almond Oil and if it is more than 1% I would do a small test batch first. I would recommend adding in Castor Oil to help create more of a creamy lather. I would add it in at about 3-5%. Are your ounces weight or volume? I just tried formulating my first recipes and then decided to plug the ingredients into the batch calculator on your site. when I plugged in my ingredients, they all had an identical amount. this does not make sense to me. am I doing something wrong? when I figured the amounts out myself, they were very different. I am looking to make 5# using Shea butter, avocado o, castor oil, cocoa butter, olive oil, coconut oil, and palm oil. thanks! That’s strange. It completely depends on the percentages or ounces/grams you are choosing to enter. If the percentages differ from each other the final totals should also differ. I’m hoping you can help me out with a weird issue I’m having when trying to scent my cold process soap with essential oils. I am brand new to soap-making and it has quickly become an obsession, thanks mostly to the wonderful resources that are provided here! I started off with a few simple recipes, your beginner cold process recipe first, and then created a few of my own recipes with your lye calculator that all turned out beautifully. 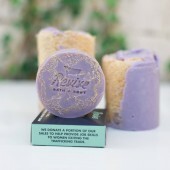 Then I decided it was time to attemp a scented soap, and I prefer to use essential oils to keep everything very natural. My first try accelerated trace and got a weird curdled look. The soap smells great, but has a strange translucent look and never fully hardened. I thought it was due to my essential oils being a bit old. So I tried again with brand new oils, and different scents. I used less than your fragrance calculator recommended. And again, my resulting soap is soft, gooey, and almost translucent. The same exact recipe without EO’s is creamy white and firm after 24 hours. I want to keep trying, but can’t afford to experiment too much with expensive EO’s. Any insight would be so appreciated. Thank you so much for such a wonderful resource. Some essential oils can overheat your soap but this can be prevented. Instead of insulating your soap for gel phase you can try putting it in the fridge or freezer to keep temperatures down. I found a great safe, long lasting CP Scent alternative. Downy Unstopable wash beads. The scent lasts forever, cheap and available at your grocery store. If its safe to put into your clothes then its safe in your soaps. For a 3lb log I pour in 1/2 a cup or so into my oil/lye mix and stick blend. Been making CP soap with the wash beads and results are great. I’ve used essential oils and fragrance oils over the years and found them to be expensive and results vary from brand to brand. I have the perfect recipe now and I rarely use anything else. I can unmold and cut in 24 hours or less, and the soap cures hard and is super lathery. Olive oil is a soft oil, meaning it’s liquid at room temperature. Soaps made with a lot of soft oils will take longer to unmold and cure, and will be softer overall. For instance, soap made with 100% olive oil can take several weeds to unmold. The great news is they feel amazing and gentle on the skin! You can also water discount your soap. With less water, the soap will harden and unmold more quickly. It does make the soap thicken more quickly though, so be prepared to work fast. 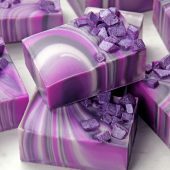 I am looking for a recipe for a CP soap that would allow me to pour a very thin slab and then roll it the next day to use it for the outside of a rimmed soap. I tried my normal palm,coconut,olive recipe and palm, coconut,canola recipe and both of them cracked when I rolled them. Can you suggest a combination of oils that would make a pliable slab of soap? Would going palm free help? Thank you. Might you please comment where I am going wrong? Pour the caustic soda into the water and stir well to ensure fully mixed & dissolved. Once both are sitting on 30-40 degrees Celsius, I pour the water mixture into the pot of oil and stir. I have been told to expect the mixture to thicken as I continue to stir it, and as it cools – but it doesn’t really thicken at all.. I then add colour &fragrances, etc. Mix again. Then I begin filling the moulds and cover with a piece of cling wrap. As I understand it should start to harden after 2-4 days, but 10 days have passed and it has not gone hard. A friend told me that I need to use palm oil or some other hydrogenated oil, but the whole point is to use Ireland grown oils! I would be very grateful! I don’t think you’re doing anything wrong! Rapeseed oil is a soft oil, meaning it’s liquid at room temperature. 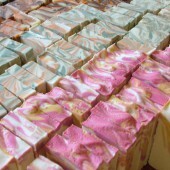 Soaps made with 100% soft oils will naturally take longer to unmold and cure. 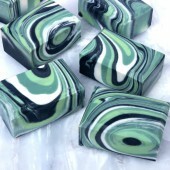 For instance, 100% olive oil soaps can take at least 1 week to unmold and up to 6 months to cure. It does take a bit longer, but the result is a nice, gentle soap that feels great on the skin! I am new to soap making and am looking to build a business with the art. I have a question concerning using hp and cp together. What Im wanting to do is mold hp into a silver dollar sized rod to run through the center of my cp soap. Im using a loaf mold and the hp soap will be centered in the cp bar. Will this present any issues with the end product? Any advice/suggestions are appreciated! 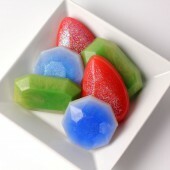 We haven’t done a lot of testing with embedding hot process soap in cold process, but I think it would work just fine! I would definitely recommend a small test batch to see how it works. I would recommend letting the hot process soap cure a week or so. That way any excess water will evaporate, which prevents any shrinking inside the cold process soap. Thank You so much Kelsey! I have read and watched quite a bit of the content here – extremely informative. Big question on the M&P bases. Which one would be the most moisturizing on the hair, and can any oils be added to it to act as a built in conditioner, and if so what do you suggest and how much per pound of M&P do you recommend. 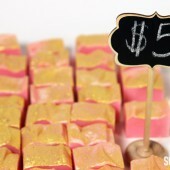 In general, we don’t recommend adding very many extra oils or butters to melt and pour soap. 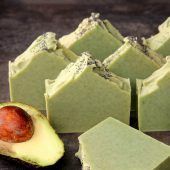 This is because the soap is already perfectly balanced, and adding extra oils and butters could cause the soap to be greasy, or remain soft and never harden. If you want to add extra oils to your base, we recommend adding about 1/2 tsp. oils/butters per pound of soap. Lol, I’ll read them now. I made my first batch of cold process soap this week and cut it into bars tonight. We can get humidity over 50% so I have the closet door open and a fan on the new bars hoping they don’t get the Dreaded Orange Spots. My super fat is at 6%. Here’s my question. I’ve been reading that I can add either Rosemary oil or Vitamin E to my soap to help prevent the Orange spots. But how much? Is it so much per how much oil weight is in the recipe or in the total weight of water and oils? I can’t seem to find a definite answer anywhere on this and as you can tell I’m a new baby to making soap. Thank you for your time. Vitamin E oil can be used in your cold process recipes to help prevent rancidity. It’s great if you’re using oils with a shorter shelf life, like hazelnut oil, or if you’re soaping at a higher superfat. We recommend using that at 1% in your recipe. That is 1% of the total weight of your soap, including oils, liquid and lye. Has anybody read this and or know more about it than the article says, this will hurt a load of small businesses and those companies like Brambleberry that supply those small businesses. I hope it is ok to post that link, i really feel this needs to be spread, my sister and i made our first CP batch Saturday night and it turned out really good, didn’t have proper loaf mold so we improvised but the lard soap came out perfect, we just have to wait the 8 weeks for it to dry. We hope to start a small business making custom natural and healthy soaps for people and this could squash our business before we can even get it started. Thank you for the link, I have joined the coalition and passed the link on to my sister who will be my business parter if we get off the ground, I also know of a woman out at lake of the Ozarks that is a soaper andI will be passing the link her way. Thanks again. I don’t know if it will work on yours though I don’t see why it wouldn’t. The cheap M&P I used, well i dont even know who made it. Label is gone though I’m sure i could look it up. 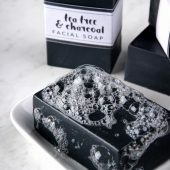 I posted a question about the LCP soap here and its gone. Was it removed for a reason? I have been reading a lot on things to help harden softer recipies, I’m very new to soap making and will be doing my first CP batch this weekend. My question is, in all my reading I have read that adding Sea Salt at aprox 1 table spoon per lb will help on hardening if desolved in to the lye water before adding to your oils. Is this correct? 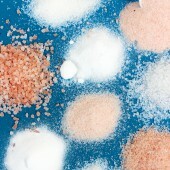 I aslo understand sea salt is beneficial to the skin in many other ways. Your feed back is much appreciated. Wow, it sounds like you have really been through the ringer lately. I’m so sorry to read about your troubles and the theft. That sounds like a stressful, trying time. Hello, my mom and I are so excited to have found your website!! Yay so much valuable information! Question, you dont mention the water lye amounts for all of your recipes above, can you share what the amounts you use are? So I ran two recipies thorough the lye calculator. And the first one was 10% shea butter (unrefined )30% coconut oil 30% palm oil and 30% olive oil. And the oils would add up to 100 ounces. And the final recipie, 147.21 oz. Then I did the same recipie as above but with refined shea butter. The total batch was 147.26 oz. I don’t really know ewhy they vare different. 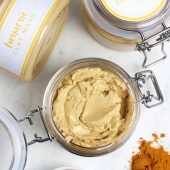 Do the different shea butters have different qualities? I was wondering if you can help me out. when I run the palm free for 96 oz. on the soap calc. I get hardness 29.5 cleansing 10.3 conditioning 65.3 bubbly 10.3 creamy 19.2 iodine 83.5 INS 112.5 is this correct? sf 5 % and water 38% Am I doing something wrong? I can tell you the palm free recipe will be a soft recipe. That’s because palm oil adds firming properties, so without it the soap will be softer. It will definitely feel creamy, and have a stable lather because of the coconut oil. If you want even more bubbles, you can add castor oil at 2-5%. Hi. 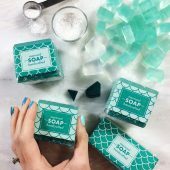 I’m new to soapmaking and I love your website with all the great info you share. I’ve used 30% coconut oils in my soap and find that it’s a bit drying for me. 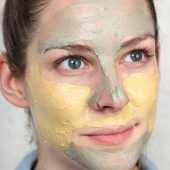 I’d love to make a bar of soap that I could use for my face — what combination of oils and percentages would you recommend? 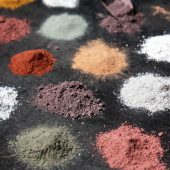 I usually work with pomace, palm, coconut, avocado and castor oils — what combinations of these or other not-so-expensive oils would you suggest? Thanks! So glad you love the website! Coconut oil is nice and cleansing, so much so that too much can be drying on the skin! To make a facial bar, you can reduce the amount of coconut oil to 15-20% and increase the other oils in your recipe, like olive oil or avocado oil. Thanks so much for your feedback! That’s definitely something to keep in mind. Just to let you know, I did remove the link from your comment. I really appreciate you sharing that, but we felt the image may be upsetting for some of our readers, including children. We like to let all our customers know that we work with vendors that have the same type of commitments and values as we do here at Bramble Berry. This is why we only purchase palm oil from vendors who are members of the Roundtable for Sustainable Palm Oil, also known as the RSPO. The RSPO was founded in 2005 to create a system for certifying sustainably grown palm oil, and to create guidelines of membership for certified growers. These guidelines cover more than just environmental stewardship; members of the RSPO must report on and provide better working conditions, better wages, and foster local discussions and input on their impact on local and native land. There are five wonderful principles that share in our same beliefs of sustainability and development in using palm oil with their Palm Oil Green Development Campaign. 1.) Alleviating Poverty through Wealth Creation: Palm oil provides developing nations and the poor a path out of poverty. Expanding efficient and sustainable agriculture such as Palm Oil Plantations provides small and large plantation owners and their workers with a means to improve their standard of living. 2.) Sustainable Development: Sustainable development of palm oil plantations and growth of the palm oil industry in developing nations can and will be achieved through consultation and collaboration with industry, growers, lobby groups and the wider community. 3.) Climate and the Environment: Palm oil is a highly efficient, high yielding source of food and fuel. Palm oil plantations are an efficient way of producing fossil fuel alternatives and capturing carbon from the atmosphere. 4.) Opportunity and Prosperity: Developing nations must be allowed the chance to grow and develop without political intervention by environmental groups or developed nations. It is crucial that developing nations be given the same opportunities which developed nations have benefited from. 5.) Property Rights: Efficient palm oil plantations and the growing demand for palm oil give smaller land holders greater opportunities to make a living off their land, maintain their ownership and support their rights to property and prosperity. Hi.. I have recently become obsesses with soap making and I made my very first cold processed soap this past weekend and it came out great! Its currently curing :). My question is: I don’t have the 10″ silicone mold but i have various Tupperware containers in different sizes. How can i determine how much oil to use so that I am not overflowing the mold or using too little? That’s so exciting, I’m glad your first soap turned out well! Thanks for answering this as I was confused as well. I’m just shifting from melt n pour to cold process. I am a bit confused by your answer though. Let’s say I have a container, I place it on the scale, tare it, then fill it with water. Let’s say it 50 oz. So that would mean all of my oils should add up to 50 oz to fill the mold, correct? If that is correct, then I am confused by the measurements you’ve provided in this article. That adds up to 33.8oz, not 50oz as noted in the mold size. Either I’m not understanding something or that recipe is not intended to fill that mold to the top. Thanks in advance for helping to clear this up for me. Hi, I am A complete newbie at CP soapmaking. Having two little ones in the house always made me nervous. But now I have a free room to make my own I am going to give it ago. I was wondering with the recipes above can you then add essential oils to make the scent or will that change the recipe all together? You’re welcome! We typically use soda ash (washing soda) for laundry soap. It’s great for removing stains! As the soap cures, excess water will evaporate out. That helps make your soap milder and last longer in the shower. It’s completely normal! thank you @ Kelsey I really appreciate all your effort. I hope u are good.I want to make a transparent soap but I. don’t have the idea pls can u shed more light on transparent soap and how to do it and secondly is there any other alternative for cp curing period bcoz I don’t think I can wait for d whole four weeks and my customers too can not wait for the long period. Also, if you want your soap to be ready faster, you can hot process it! Hot process soap “cooks” the soap, which speeds up the saponification process. While hot process soap is ready to use as soon as it’s cool, we still recommend letting it cure. That way the excess water evaporates, making your soap firmer and last longer in the shower. I’ve been making CP soap and lotion for about 6 months now. One of my nieces has Keratosis Pilaris and your beginner lotion kit has really helped to clear it up. I was wondering if you have a recipe you recommend for CP soap that would help her as well? Hey Matt! I would love to know which beginner kit you bought for the lotions. My children have KP too and I’m trying to find something that helps. Im very new to soap making and I have two batches curing right now. The first recipe is a recipe I used by playing with the numbers on the lye calculator and unmolded beautifully. The second batch is the same recipe only I added 4 tablespoons of colloidal oatmeal at trace. What are your thoughts on my percentages of oils? I really hope they come out to be nice firm bars that are lathery and moisturizing! That sounds like a great recipe! You have a nice mix of hard oils, like coconut oil and lard, and soft luxurious oils, like olive oil. 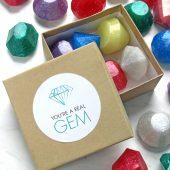 That will make a firmer bar that still feels great on your skin. If you want your bar more firm, you can up the levels of coconut oil and lard. The ounces for all the oils…are those liquid ounces or weight ounces?? How exactly would you measure the solid oils? And then, how do you figure in how much lye and water you need? That’s a great question! We typically measure all our recipes by weight. We find that gives us the most accurate measurements! 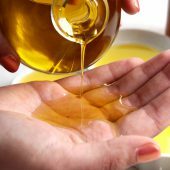 Hello lovely ladies of Brambleberry, I have run out of olive oil, this article says that Canola is a wonderful replacement for olive oil, and this made me sooo happy, however, some people have told me canola will make my soap rancid and should NOT be used, well, if you guys say it’s fine then I would love to try, what is your opinion on canola? I would love to make up a batch of your Old Faithful. I also have a question about your “love” lotion bar, could this mixture be put in molds rather then a push up tube? I have been dabbling in the art of soaping for a couple of months and only have a little experience I’ve read most of the articles I can find. 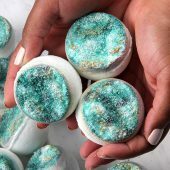 I have cruising Pinterest for ideas on how to design my soaps and hope to replace all my store bought hygiene items with homemade ones. I recently came upon a pin pretaining to the easy way to make liquid soap…. It says to shred up a bar of soap add a small bit of extra oil and water. Upon trying to do so with my own homemade bars it works great as a body wash but i was hoping to use it as a dish liquid…. When poured in to a sink and extra water is added the soap bubbles but the the bubbles quickly disappear. I am looking for a quick way to do this until i can afford the potassium hydroxide. My soap recipes usually contain 30% coconut oil 20% canola oil 30% olive oil 15% castor oil and 5% veg oil. I was hoping for some suggest on a more stable lather if at all possible. Thanks in advance! Also, adding extra free-floating oils can inhibit the lather as well. If you’re adding extra oil to the soap and water, it may help to add less or leave it out. That will help the bubbles as well! Is this formula good to go, what are your suggestions? also, I want a strong fragrance smell that lasts,what amount should I use, the min-max? For test batches how much ingredients do you suggest that we use so that we do not waste ingredients when testing? Thank you Kelsey! Is it okay if I were to add Vitamin E to the formula and if so, what amount would you suggest? I was looking at charts that say you should only use certain percentages of certain oils. But why? Is it because they will do the extreme of what they’re supposed to do? for instance if I use a 100% Flaked Palm kernel oil recipie that is only supposed to be used at 15%, is it because it will harden too hard? Or is the actual concerns that it will be harmful to your skin? Thanks! Cold process recipes are typically a mixture of hard and soft oils. That gives you a firm bar that moisturizes your skin. When we recommend percentages, that’s the amount we found works best. For instance, coconut oil works great at 30% in your recipe. It adds firmness and cleansing properties. However, because of its cleansing properties, using more than 30% can be drying to your skin. Hi! 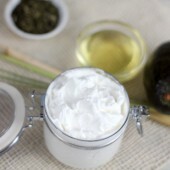 I want to formulate organic body butters. I see these are recipes for cold process soap recipes. Do you have any for body butters? 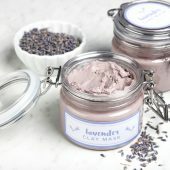 I want to create organic body butters that lasts so they would need to not mold. Is it possible to formulate them using these formulas or is their another way using this website that shows us how we can formulate them and the amounts to use? If you’re making a body butter with just oils and butters, they can be considered organic as long as you are using certified organic ingredients. Typically, those recipes contain 50% butter and 50% oil, but can be adjusted based on your preference. Thank you for your response! Very informative! I have a question though. If Body butters do not need water then why do some companies use water in their formulas? I have a Whipped Shea Cream and it contains water. Why would they need to add water unless the difference is because they call it a Cream and not a Butter? Hi! I have been using powdered goat milk for my goat milk recipes but wanted to start using fresh goat milk. I used frozen/slushed goat milk, but I did add the lye all at once. Yet I continuously stirred the mixture. I cut the bars and they looked normal. After a week the soap smells fine, yet it looks very “cloudy”. It’s not bright white spots like lye. It’s just cloudy, speckled. Could this be due to overheating? Is the batch still good? 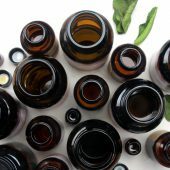 When calculating fragrance oil for a cold process recipe, do you calculate based on oils in the recipe only or for the entire recipe including the lye water? I find so many varying recommendations and would like to know the best process. I have been calculating based on oils only and do find my finished product to be somewhat “fragrance light”. This is based on 1 ounce fragrance per pound of oils. Please advise, and thank you! That’s a great question! 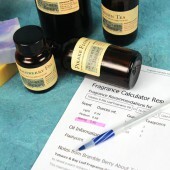 You want to calculate your fragrance oil based on your entire batch weight – that includes the oils, liquid and lye. Hi. Have been making CP soap using 31/31/31 % plus 7% shea butter. Superfatting at 5%. All my soaps are curing now. Noticed when unmolding they are already quite a firm bar of soap. So my question is 5% superfatting enough. Or should I superfat by 7%. I am trying for a firm but moisturing bar of soap. That sounds like a great recipe! If you want to make it a little softer, you can increase that superfat slightly. You can also decrease the amount of hard oils in your recipe (coconut, palm and shea butter) and replace them with softer oils. You could increase the olive oil, or add another great moisturizing oil like avocado oil. So I found a mediterranean oil that is a combination of olive oil, grape seed oil, and canola oil. I used this in a a few cold process recipes and haven’t seen anything wrong yet. I guess I just wanted to see if this is something I can continue to keep using? I use it in conjunction with palm oil and coconut oil too. Thanks for your help! 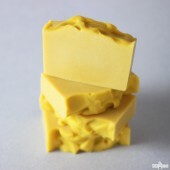 Ok I have always wondered about this……..(I feel silly for asking it) Can you make soap using butter. Salted butter. Does anyone know the saponification rate? We have never tried using butter, so I’m not exactly sure! From a quick internet search, several sites recommended clarifying the butter before adding it. Also, I would recommend using it at a low percentage in your recipe, like 15% or lower. Shea butter, palm oil, palm kernel, canola, avocado, sunflower, castor, hempseed, Mango butter, cocoa butter, coffee butter,tamanu. Can you recommend a recipe or will one of the oils I already own be a good substitute for coconut oil? Coconut oil adds firmness and cleansing properties to your soap, and there is no direct replacement for it. However, you can make a 100% olive oil soap. It’s very gentle and silky. Do any oils exist that are good as a replacement for coconut oil? I am interested in finding a moisturizing CP soap recipe that does not contain coconut oil, as I have a relative who is allergic to it. I know I can make an all olive oil/Castille soap, however, I’d like to make soap that is not soft and will cure by Christmas. Are there any good substitutes for coconut oil? I know it’s part of the “holy trinity” base of soap making. I am finding that, although the Basic and Basic Plus make really nice soap (and I have had success with them), they are drying to my skin. I have scoured the Internet looking for coconut-free, moisturizing, simple CP recipes, to not much avail. I don’t want to put a lot of extra “stuff” in my soap and would like to keep it oils. Any suggestions, or recipes, would be appreciated. There are no direct replacements for coconut oil. However, you can add some other ingredients to add some hardness to your recipe! Cocoa butter and shea butter add firmness and moisture to your soaps. You can use both of those at 15% in your recipe. However, you don’t want to use more than that, otherwise your soap can crack. I’ll include an article on those butters and other oils. Thank you for your reply, Kelsey. I am going to try your suggestions and see how things turn out. I have recently been adding sodium lactate and notice a big difference in unmolding. I do appreciate the help. 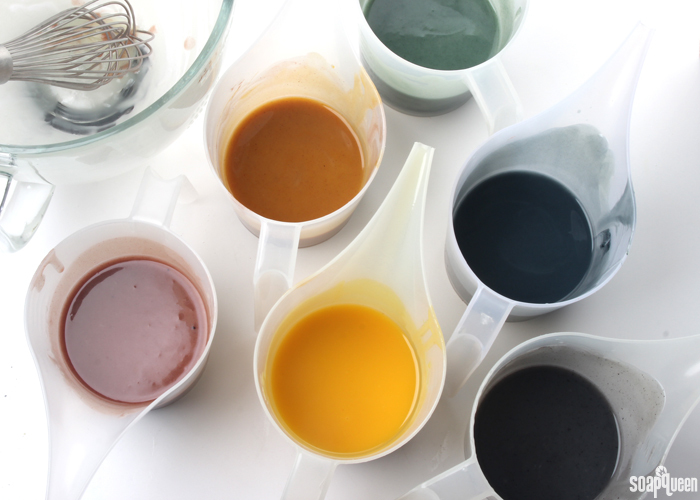 Hi, once you have poured your mixture into your moulds, where should you store them? Are you supposed to put them into the oven? Is there a tutorial on this subject please? After your soap is in the mold, you have several options. One option is to gel the soap. 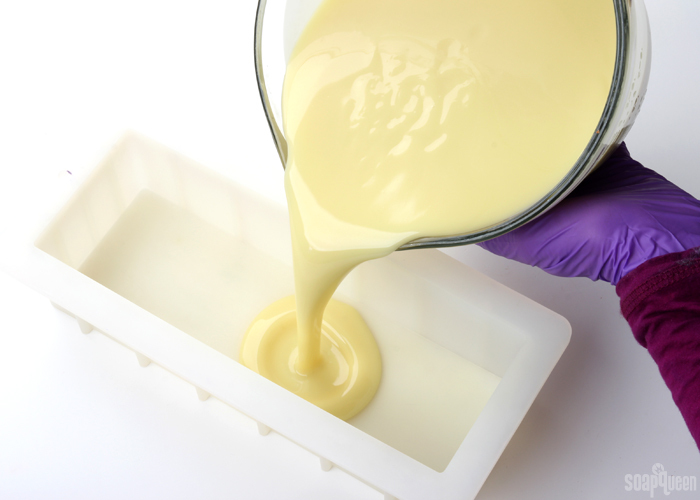 ‘Gelling’ and ‘gel phasing’ in cold process soap refers to a part of the soapmaking process where the soap gets warm and gelatinous – up to 180 degrees. 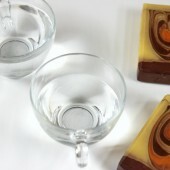 Gelled soap also has a more translucent, shiny look than non-gelled soap. None of these things affect the final outcome of the soap after a full cure, just how the soap looks. To gel the soap, you can place it on a heating pad on medium for 20 minutes, or you can put a piece of cardboard over your soap and wrap it with a towel or blanket. If you place your soap in the oven after it’s poured, it will force a hot, extended gel phase. This will give you nice vibrant colors. I’ll include a tutorial on how to do that! This was a huge help for me tonight in preparing a new recipe. Thank You so much! Also, I’d like to add essential oils to the mix for scent. How do I know how much to add and how it will affect the process? Thanks a bunch for your great info!!! Our Fragrance Calculator is a great tool. To use it, just plug in how big your recipe is and which essential oil you want to use. 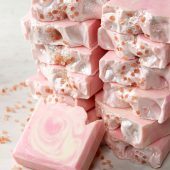 I am looking to make my first batch of cold processed soap. I am wanting to use the 33/33/33 recipe using lard, coconut oil and canola oil. Where can I find a detailed recipe that’s fool proof for this newbie? Also, looking to buy a 3 lb. mold. What kind of mold works best- wood or with a silicone liner? Thanks! Also, we sell a 10″ Silicone Loaf Mold that holds about three pounds. It works great! It’s easy to unmold and clean out. On the Old Faithful with a Twist, it seems like the amount of almond oil is off for the 18 bar mold. It seems out of proportion to the other amounts. Castor oil is a thick oil great for adding bubbles to your soap. Cocoa and mango butters add some firmness and moisturizing properties to your soap. Because they are so different, substituting them will not give you the same results. You can leave the castor oil out and increase the other oils in your recipe. If you replace it with the butters, keep in mind your bar will be harder and more silky. It will not bubble as much though. Hi! In the Beautiful Swirls recipe what are good substitutes for the Hazelnut oil & the Sunflower oil? I have Sweet Almond oil, Castor oil, Apricot oil, Palm oil, Canola oil, Olive oil, Coconut oil, Grape Seed oil, & Avocado oil. I made the other recipe and it came out Great! I couldn’t have done it without you!! Thank you so much for your help!!! Sweet almond oil or canola oil are good substitutes. They’re both lightweight oils, like the hazelnut and sunflower oil. My last question can castor oil substitute for the chia oil? Thank you. You can substitute Canola Oil for Rice Bran Oil, just make sure to run that recipe through the Lye Calculator again. Also, when you run a recipe through the calculator, you are entering the total weight of your oils, not your whole recipe. This means you will have to do a little guessing to get 50 oz. Hi Kelsey! Thank you very much for getting back to me! I have on hand Apricot oil, Grape seed oil, Avocado oil, Palm oil, Canola oil, Olive oil, Castor oil & Coconut oil, which of these can I substitute for the Chia oil? Thank you! I also have Sweet Almond oil! Chia seed oil is a lightweight oil, so you wouldn’t want to substitute it for a thick oil like castor oil, or a hard oil like coconut oil. Sorry, I almost forgot to tell you that my 9 Bar Birchwood mold has a silicone liner and the four plastic pieces that fits on each end and both sides! Hello everyone! I would like to make the Perfectly Palm Free recipe in my 10″ silicone loaf mold, however I don’t have any Chia oil and I see that Hempseed oil would be a substitute for it. I don’t have any Hempseed oil either! What is a good substitute and do I use the same amount of the substitute 1.7oz? Since my silicone mold holds 50oz. when I run the recipe through the Lye calculator to determine the amount of lye and liquid to use to use it looks like (I used ounces) the oil weight=34.80oz., I superfatted by 5%,lye amount=4.593oz., liquid amount=11.48oz. for a yield of 50.88oz. Then I used the Fragrance calculator it gave me the amount of fragrance to use (I like my fragrance strong)which is 2.54oz. By my calculations 50.88oz.+2.54oz.=53.42oz., I think that this is too much for my mold or am I missing something??? Should I lower the fragrance amount or have a silicone bar mold handy for any extra soap that won’t fit into the loaf mold? Should any of these soap recipes made in the 10″ silicone loaf mold or the 9 Bar Birchwood mold be covered and wrapped in a towel to go through gel phase? I thank you in advance for all of your help and all that you do to help us along our journey into the soaping world!!! Hi I’m new to cp soap making, but my family keep bees so would like to incorporate beeswax in to a recipe. I did see in a magazine someone did this using olive, coconut and almond oils, but I don’t have a clue what proportions this would be, can you please help. Thanks. Any help or suggestions greatly appreciated. Greetings! I just made my first batch of CP soap! I’ve read a lot of books, watched quite a bit of soap queen tv , and practiced countless times in my head….by doing all of my theory before moving on to my practical application I feel like I achieved a nearly text book result! I’m very pleased. I looked over several lye calculator but ultimately ended up using Bramble Berry. It was the easiest for my non mathematical mind!! Just curious as to your opinion oflard. I did use it in my formula but now I must wait several weeks to really see. I have a freezer full of lard that I rendered myself from a friends hog. Sure hope it works out! I need to use it up! I also used olive oil, sunflower oil, coconut oil and castor oil.I actually used about 16.5% of castor…my question is….do you think my soap will end up too sticky? 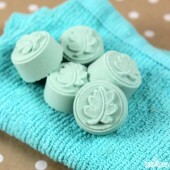 I’m so glad that you have started making cold process soap, that’s so exciting! I’m also glad that our lye calculator was helpful :). Castor oil can be used up to 25% in your recipe, although using much more than 10% can result in a softer, sticky bar. 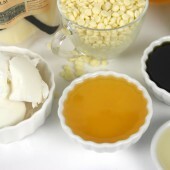 You may find the blog post, “Common Soapmaking Oils and Butters,” helpful in the future when formulating recipes! It has a suggested usage rate for each common soapmaking oils 🙂 I also included a link to a blog post that has more information regarding formulating recipes. I hope this helps, if you have any more questions, let me know! in addition to the previous comment i posted would this recipe be ok ? Hi, i have a question about CP recipes. is it possible to make CP soap using only Hemp oil, Hemp butter and babassu oil? what would the ratios be if so and if not do you have any suggestions? Love that you ladies give us so much helpful information, not to mention great products. I’m an avid user of the “Old Faithful” recipe for the 18 bar mold. I recently bought some red palm super olein oil and would love your thoughts on incorporating it into the Old Faithful recipe. I was going to send it back but figured some where, some how there is a recipe using red palm super olein. My thought is that I should substitute part of the (regular) palm oil with a percentage of the red palm SO. Don’t want everything turning orange so guess a small percentage, any guidance from you would be greatly appreciated. Hi all forgive me but I’m struggling a little with trying to calculate how much oils to use for my first batch. Im very new to soap making in fact I’m yet to make my first soap. I would like to make a basic mixture with coconut oil, palm oil and olive oil. I have 12 moulds that are 125 grams each. How do I calculate how much oil I need and run this through the lye calculator in order for me to have the correct amount of mixture? No worries, it can be a little tricky! So first I would figure out how much you need total. If each mold is 125 grams and you have 12, you need 1,500 grams of soap, or 52.9 ounces. Once you know how much your mold can hold, then it’s a little bit of a guess and check process with the lye calculator . I would recommend working in percentages in terms of entering the oils in your recipe. Once you enter all your oils, the calculator will ask you how much you’d like the finished oils in your recipe to weight. You can go ahead and throw out any reasonable number, because you can adjust it later. Choose your superfat percentage, then hit “Calculate.” You will see that the calculator will give you the weight of each oil, along with the amount of lye, and water. This total weight is your yield. Most likely, your yield will be too big, or too small. At this point, you can “Resize” your batch by entering a new number for the amount of oils. You can resize your batch as many times as necessary to get an appropriate yield. I’ve got this far, in understanding how to calculate my recipe for a 3 lb mold. My question is, how do i know how much more to add, if I want add little more to the top, to make it taller, textured? About how many ounces would be safe, instead of me testing too many times? Thanks in advance for your reply! hi, i’m completely new in soapmaking. i would like to know where is the right place to have a dicussion as i believe this section is actually only for comments. I have very dry skin and was reading that lotion bars are more moisturizing for the skin instead of soap. What do you think and do you have a good lotion bar recipe to share? Thank you for the lotion soap recipes. I assume they would be good to use after cleansing with soap or do they have cleansing properties since you don’t wash them off? Also, I am looking for a SUPER moisturizing soap with nice creamy bubbles that leaves the skin feeling soft and smooth without that tight ashy look and feel. I have mature skin and I hear Mango Butter is good for that. Do you have any suggestions? I am still quite new to soap making and I love making CP soaps yet my quest is to produce the best moisturizing all natural cleansing bar for my dry skin. The only thing I can relate the feel I’m looking for is Dove Bars which I know are full of unwanted chemicals. Can you help? Many thanks. Hello! I’m attempting cold process for the first time. I am wondering if possible to use a whisk attachment on a mixer instead of an immersion blender. Would this ruin the saponification process? I am thinking about doing a canola, olive, coconut, sweet almond and caster? Do you think that would give good results? It all depends on the percentages in which you use the oils. 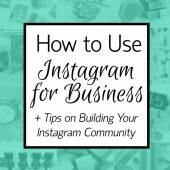 You may find this blog post helpful! It goes more into depth regarding how much of each oil should be used in a recipe. Of course these are strict rules, but amounts that we have found work well. The one thing that jumps out at me is that this combination of oils are all fairly soft, and don’t contribute to the hardness of the bar. 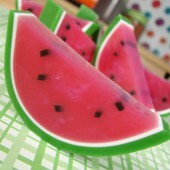 Palm oil is commonly used in soap recipes for this purpose, so you may want to consider adding some to your recipe :). Another suggestion is to add Sodium Lactate to your lye water, which is a liquid salt that helps the bar harden faster. Could someone tell me how cool the lye water must be to add sodium lactate – I am new at this and I keep seeing cooled lye water but no specifics. I have been soaping at 110 to 120 degrees and have had no problems with soda ash but don’t want to have to go lower. What is the total number of ounces you should end up with when you give a recipe of 33/33/33 ratio, for example. Is it per pound? How many total ounces would you need for a 5lb mold? Also, do you substitute ounce per ounce when changing from and oil to a butter or vice-versa? I am trying to figure this out so I can get started making soap. Your help is greatly appreciated. When working with percentages, its usually best to decide how much soap you want to make first. Then you can calculate how much oil you need, based on the percentage :). What is a good substitute for hemo oil? I have only been soaping for 2 Mo. now. I am having a hard time figuring out how to use the soap calculator. Where should I go to find out moon on how to use it ? I hope this helps Elaine! I’ve never made bar soap before and I want to very badly. I like that you provide a break down in ounces of what to put in the soap but how do I go about making the soap with out adding lye? I can’t seem to find any such resource in the actual process. Hi, I purchased a bunch of palm oil kernel instead of palm oil once from your store. I can’t find any moisturizing recipes that have that as an ingredient except the one from Anne-Marie’s book with the fresh avocado slurry and i wanted to try something without the fresh avocados. Do you happen to have a link to any other recipes using it? I have avocado oil, shea butter, cocoa butter, coconut oil, palm oil, castor oil, jojoba oil, sweet almond oil, and of course the palm kernel oil i would like to use up. Any help would be appreicated! oh and olive oil. Can’t forget that staple item. I have a question about the perfectly palm-free recipe. I ran the percentages through soapcalc and it’s giving me a hardness of 30. I’ve never soaped with canola, avocado or hemp before. I know that soapcalc can be misleading with olive oil; is there something about this recipe that I’m not aware of that is throwing off the numbers, or is this going to be a really soft bar that will take a loooooooong time to cure? can you tell me method of making soap with palm and coconut oil. 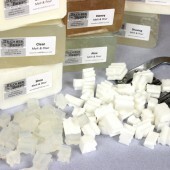 Glad you’re going to give cold process soap making a try! Palm and Coconut Oils are two very popular oils when making soap, and a large majority of recipes contain both. 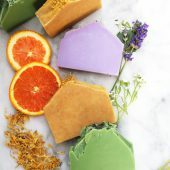 We have found that the best bar of soap is made up of both hard and soft oils, and because both of these oils result in a hard bar of soap, I would recommend adding additional oils as well. You may find that only using these two oils may dry out your skin. You may find this blog post helpful, it is a bar of soap containing only Coconut Oil! I have a question about the lye. Is it normal for the lye water to be somewhat cloudy after the lye has been dissolved? I make sure that there are no lye bits in my water but it also seems to have like an oil slick type appearance on the top of the lye water, its not a lot just a litter. Is this normal and does this effect the bar in anyway? Also, does this have a higher capability of possibly burning somebody? I have a nut allergy and I am concerned about using nut oils in my soap. Is there a good substitution for sweet almond oil? If you’re looking for a good replacement for Sweet Almond Oil, I would recommend Apricot Kernel Oil or Peach Kernel Oil. Just be sure to rerun your recipe through a lye calculator! Can you substitute canola oil for all of the olive oil in a 33-33-33 recipe? How will this effect the soap? Absolutely you can do that sub. I don’t notice a huge difference between Olive and Canola (blasphemy in some soapmaking circles to say that) but some soapmakers swear Canola causes soap to get DOS faster and not have as long of a shelf life. =) So, do the subs and then make a decision for what works for you and your soap and your budget. I’m new to CP soaping so I am so thankful for these recipes. 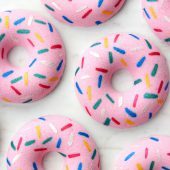 I have a question about the swirls recipe. I noticed several of the oils used have limited shelf life (Hazelnut and Sunflower are only 3 months). If I order from Bramble Berry, how long had it been sitting before it reaches me to know how long it will last? Also, how long would my soap be good for after I make the recipe? Our oils sell through pretty quickly, so once you receive your oil, I would write a date on the bag and start the shelf life from that date. To ensure that your oil lasts as long as possible, I would recommend placing it in the fridge or freezing it if you don’t think you’ll use it in time. Once your oils are made into soap, the shelf life no longer applies because they have been made into a completely different substance. Your soap won’t go bad (ie: grow mold)but eventually it may start to get crumbly, usually after about 6 months or so. I hope this helps! So I dissolved some salt in a small portion of water and then added it to the lye solution. It turned the water cloudy. Is that expected? Other than that it behaved as any other batch. Also, I also use goats milk in all my soap. Other than the cloudiness it looks ok so far. That’s totally fine to have some cloudy lye water due to the salt :). I’m happy to hear your soap has been turning out well! 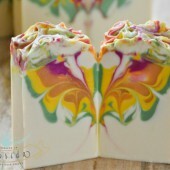 If you get images, we would love to see your soap on our Facebook Page! Salt in water…. When do you add the salt? Do you mix up the salt in the water and then add the lye to that? You’re correct, you can add the salt to your wamr water and then simply ad the lye to that mixture! I would recommend using 1 tsp. of salt water per pound of oils in your recipe. So glad you enjoyed this post and thanks for the recommendation! We recommend soaping when lye and oils are between 100 – 120 degrees and within 10 degrees of each other. If you soap too cold, this can lead to soda ash. Soaping really hot can accelerate trace and lead to a soap volcano! Hope this helps! Hi! 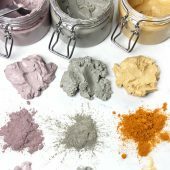 I’ve been using an ( approximately) 31% olive, 27% palm & coconut, 7% castor, and 4% cocoa & shea butters or slight variations of the above recipe. I recently began using sodium lactate (1tsp ppo or less) because I purchased some new silicone molds and wanted the loaves to harden well for easy release from the molds. Since I did achieve harder bars that seemed to last longer I started using the sodium lactate in all my batches ( even in an acrylic slab mold that I use for bars I want to swirl). I noticed in two of these slab batches I got white crumbly edges and whitish spots throughout the bars. Theses were NOT lye heavy, I tested them and seem to be related to the sodium lactate as I’ve made lots and lots of batches, same recipe, same mold before. Has anyone else had this experience? the soap seemed fine otherwise but I could not sell it because it was ugly looking! I have also noticed that I end up having to shave the entire outer edges of my sodium lactate soaps because they develop way more soda ash on the outside once removed from the mold. ( I do spritz the tops with 91% alcohol). Otherwise, this recipe makes a nice lather and fairly hard bar over time. Thanks! We have never had a problem with the sodium lactate, and it sounds like you’re using the correct ratio. It could be a temperature issue; you want to make sure to add the sodium lactate to your lye water once it has cooled. I hope this helps Vicki! Sorry, I forgot Sweet Almond (2.25 oz.) in the recipe I just sent! Thank you for a great receipe–my customers tell me all the time, how they love our soap! No matter my recipe, even a 100% olive oil, always give me a very fast trace. It’s like the part that just went through the stickblender is already thick. I soap at 30-35°C, have used tap water, bottle water and distilled water. I have also tried different suppliers of sodium hydroxide. All types of FOs and EOs or scentless. I really like soapmaking but this is getting to me. There are so many beautifull swirl designs out there, and most of them require a thin trace. Yet there where I should have a thin stream of soap batter, i get “blob…blob…blob…”. Really hoping you can help me find out what I’m doing wrong! Oh no, that is frustrating! When you combine your oils and lye, how long are you mixing for? We typically don’t stick blend more than a few seconds at a time to get the soap to start to emulsify. After that point, I recommend using a wire whisk or spoon to gently stir the batch. Stirring too vigorously can thicken the batch prematurely. I hope that helps — let me know and I can troubleshoot more! I use my stickblender for a second at a time, using a spatula to move the top of the batch towards the stickblender. If I wouldn’t do that I’d have to use the stickblender longer. It’s basicly pulse, move the oils around and repeat (4 or 5 pulses) until I don’t have any oils on top anymore. I’ve been considering using a whisk, at times I use it instead of the spatula just after adding my lye. After using it for only a few seconds, an emulsion is already starting. 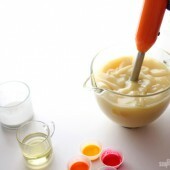 I’ve never fully used the whisk because I worry about a false trace/emulsion. I don’t get how my batch (well, the part that just passed my stickblender) is already very thick, almost the way a medium trace looks like. Have you ever heard of anything like this? Do you know what percentage of water to oils are you soaping at? Full water is 38 – 40% of the oil total. If using less than that (taking a water discount,) try upping it. If you don’t know the percentage, try running the recipe through the SoapCalc website at the pre-set 38%. Then hit calculate & view the recipe. A separate page will appear flashing in your browser – the recipe totals. Compare the water amount specified to what you are using. I only use distilled water to be certain of no contaminants. I think using a certain rate of bees wax can harden the soap bar and reduce the period of curing. What do you think? I think stearic acid also stand for the same role of bees wax in CP soap making . Yes, you can use both beeswax and stearic acid to help harden up soap as well. Beeswax can be a bit tricky to use because it has such a high melting point, so be sure to keep the rest of your oils above 170 degrees to keep it from hardening. 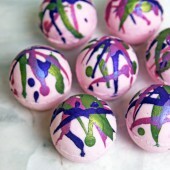 may I just ask if I can use oils for cooking in making these soaps? i see coconut oil, palm oil, and canola oil in the grocery shelves. We actually don’t recommend using oils from the store just because even extra virgin olive oils and other supposedly ‘pure’ oils aren’t really that pure. Only by buying oils from a reliable source — like Bramble Berry — can you be sure that the oils will behave correctly in soap! Thank You for the great recipes! However, I noticed on the amounts for the 10″silicone under Beautiful Swirls, it only adds up to 40 oz. surely a typo!! Oops, you are totally right — great catch! It’s been fixed now 🙂 Thanks! Thanks for the great advice as always! Gonna try those recipes this week. Glad you found them helpful, Alysia! Let us know how it goes if you try a few 🙂 Happy soaping! OK, so I have a question about the salt water. Can you use this method to harden a bar in every recipe? If so, what is the math for that? Also, does it speed the trace (i.e., would it be bad for intricate swirling)? Is this like using sodium lactate? And does sodium lactate speed the trace (and therefore make it a bad choice for intricate swirl recipes)? Thanks for another great post! Yes, using salt water is essentially the same as using sodium lactate. I would still recommend using 1 tsp. of salt water per pound of oils in your recipe (and I might do an equal 50/50 ratio for salt to water). As for speeding trace, we’ve not found that adding sodium lactate or salt water really effects trace at all, and in fact we often add sodium lactate to swirl recipes so they harden faster and we can cut them sooner to see the reults 🙂 Happy soaping! I just adore the Lots of Lather basic recipe (30/30/30/10 of Palm/Coconut/Olive/Castor) and use it as a great starting point. The recipe as it’s written makes an awesome bar of soap, lathery and moisturizing. And it’s so easy to remember; since I use 30% water to oils, four of the six weights are the same (palm, coconut, olive, and water), and the castor weight is 1/3 that weight. Just need to determine the lye weight, and I’m ready to go! This is the recipe I make every time I want to test a new FO or EO (which is quite often in my case!) – it’s naturally a very light-colored soap, so any discoloration is easy to see, as long as you use a light-colored olive oil or canola. I add powdered goats milk to this recipe at trace, and it’s a lovely super-moisturizing soap. This has been my go-to recipe recently – absolutely love it! It’s also easy to swap out 5% of this or that to play with “fun” substitutions like hemp oil; I know I’ve got a good base recipe that I started from, and the small substitutions won’t throw it off too much. In my Soap Journal, I just notate it as “LOL” and keep up with whatever changes I might make. So far, it’s never let me down! (Note that I do make lots of other recipes and have designed a few myself, but I do keep LOLing a lot! 🙂 ). I actually love an all palm oil bar! It’s hard as a rock and produces a thick almost shaving cream like lather. Babassu oil is also fun in place of some or all of the coconut oil, it feels a little gentler in my opinion. That sounds lovely, and I bet it lasts forever in the shower! Thanks for sharing Molly! I have some palm free favorites I would like to share. The way I see it, one soaper cannot clean the world! 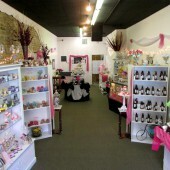 The more of us making and selling luscious handmade soaps, the better! Super moisturizing and gentle with a robust bubbly lather. This is a very slow moving recipe. It is really soft at first, but hardens up after 4-6 week cure. This is definitely a go-to recipe for me. Another palm free lovely. 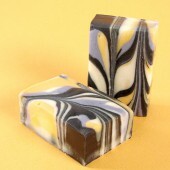 This makes a very smooth bar with a silky, creamy lather. It hardens up quite nicely. I tweaked this one many times and figured out it was the rice bran that made it so nice & firm…I think! 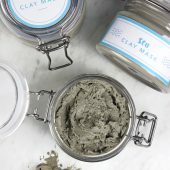 🙂 Adding a little bentonite clay makes it even better with a nice slip for shaving. I have more, but I don’t want to go coo-coo! I hope to see more soapers recipes!